This piece was about Leicester’s repentence for planning atrocities against its medieval past. Thought it worth reposting as the High Court ruled in favour of a “dignified” burial in the city. Full details and judgement here. Maybe you used to associate Leicester mainly with Joe Orton and the fetishistic possibilities of its hosiery and footwear industrial past. Oh, and the best Diwali celebrations outside of India, of course. But not any more. When archaeologists at Leicester University identified the remains of Richard III they did more than solve a great historical mystery and draw attention to the importance and excitement of archaeology, to the value of diligent study and the achievements of their own institution. 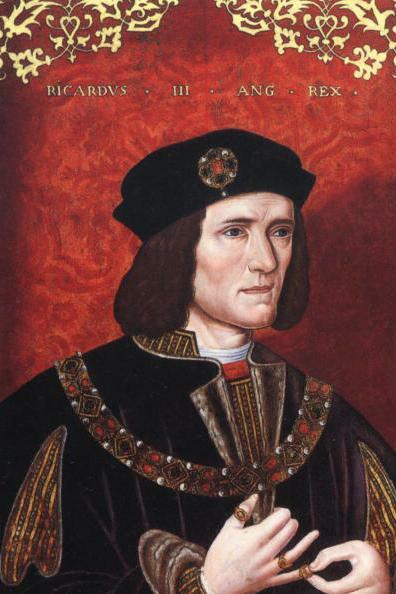 It is a key part of the narrative that Richard III was found under a car park. For when his remains of a medieval monarch were respectfully uncovered and his reputation restored from the Tudor bias of Shakespeare’s version, Leicester, which had been only the second UK city to appoint a town planner in 1962, implicitly broke a link with that ignoble past of municipal town planning. In the 50s and 60s regional councils all over the nation, in thrall to American urban design, forced their wretchedly provincial versions on us: dual carriageways through city centres (yes, Birmingham, I mean you) and concrete shopping malls (sorry Milton Keynes I tried to love you but I failed). Long unpleasant tunnels and passageways where muggers could lurk. The rain stained concrete that turned an especially British shade of damp grey-brown and provided the likes of JG Ballard and Stanley Kubrick with the settings for their dystopian fantasies. 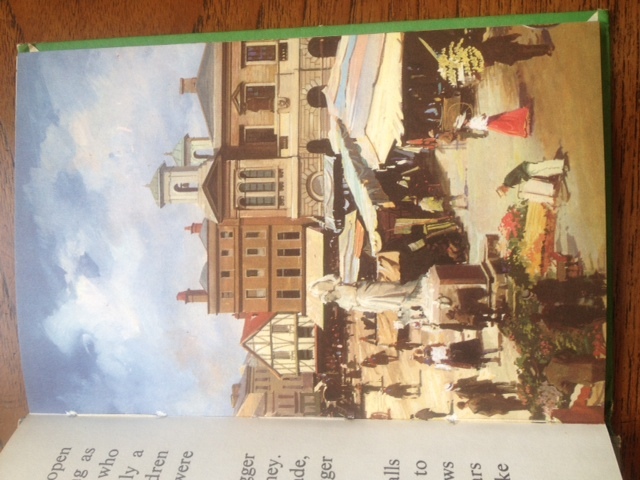 My own home town, Kingston-Upon-Thames (a Royal borough no less) was carrying out that kind of vandalism well into the 80s and it’s captured in a Ladybird book. 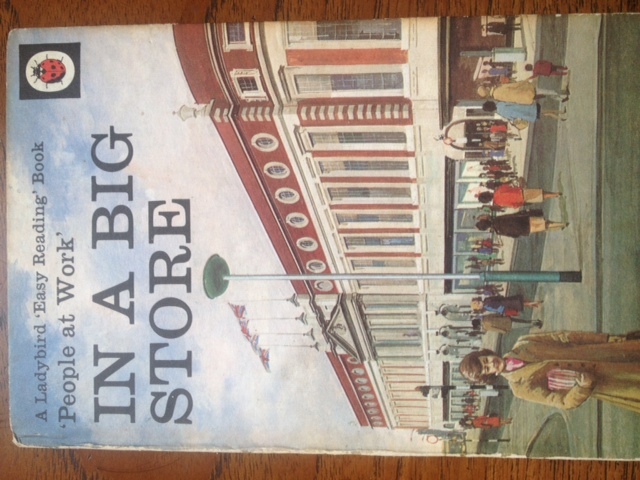 “In a Big Store” (1973) featured the grand department store Bentalls on the cover. Inside is a picture of the old medieval market place, still very much looking as it did 500 years ago, as an illustration of the old fashioned way of doing things. The town took its name from the fact that several Anglo Saxon kings were crowned there. Now the reputed Coronation stone sits forlorn inside some Victorian railings. The ancient medieval market place is still there, with its halftimbered houses, gold statue of Queen Anne and a magnificent heritage listed oak carved Tudor staircase, (which endures inside a branch of Next). But a casual visitor would never know from the 3 and sometimes 4 lane carriageways that encircle it. Kingston’s riverside, just a couple of miles from Hampton Court, is an ugly scar. Look either side of beautiful Kingston Bridge and all views are blocked by towering Lego-style brick behemoths: bombastic luxury flats, a John Lewis that sits over and astride the road like a Transformer, a solicitors’ office block the colour of manure. The 1930s grandeur of the Bentalls department store , captured in that Ladybird book was torn down in the 80s and rebuilt as the Bentall Centre mall. How appropriate that it was the inspiration for JG Ballard in his consumerist dystopia Kingdom Come. He was particularly taken by the audio-animatronic bears that used to greet visitors. Leicester City Mayor Soulsby spent 30 years as councillor including time as Council leader before becoming a Labour MP and now the city’s first elected Mayor. He admits there is regret for the desecration for the past. “We can’t make it go away. But we can tame it.” The new plans for a Richard III permanent museum have just got planning permission and are part of a strategy to reintegrate the old and the new. The ancient city of York, already brimming with tourism and heritage, is fighting via judicial review to bring Richard III’s remains to their Minster. But Leicester’s case has great moral virtue too. With its years of work by the University’s archaelogists, it’s not just about a physical reconnection, but a spiritual one too. Let’s hope other towns can take inspiration from it. A version of this column first appeared in The Big Issue magazine. 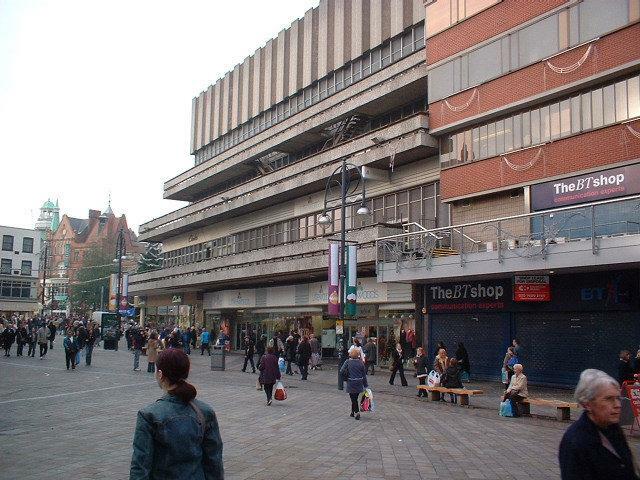 This entry was posted in Books, Business/Economics, Culture, Design, History and tagged 60s, Bentall Centre, Bentalls, books, culture, FTW, JG Ballard, Kingdom Come, Kingston-upon-Thames, Ladybird books, Leicester, Richard III, Urban planning, York. Bookmark the permalink. Thanks! And for the info about the Townsend play. Will definitely dig it out.